Hypno-baby Elizabeth Mei Lien Harris was born on May 18, 2017 at 2:57 pm. She was 4 lbs 9 oz and 18 inches long. She was at 34 weeks 5 days gestation a little over 5 weeks early from her guess date of June 24th. I woke up at 6:30 am that morning because I thought I had to go to the bathroom turned out my water had broken. I told my husband we needed to head to the hospital to be sure and get checked. At that time I had no birthing waves just the fluid coming out. We arrived at triage and got checked and sure enough the water had broken early. At that point I was really worried because the baby was coming so early. I listened to my Fear Clearing track and felt better. One of the techs came in my room and said she was going to have to give me antibiotics and put an IV in for Pitocin. I got really upset with her and told her I needed to call my doula. My doula told me what questions to ask and told me to tell them that they couldn’t induce without talking to my doctor. The nurse came in after and explained to me why the doctor ordered the antibiotics, it was because had not had my strep test yet which was supposed to happen the next week at my appointment. Once I understood why they wanted to do it I was okay, I just didn’t like the fact that they were trying to force it. I was a little concerned with my doctor because I had only met her once prior. I was being treated by a midwife at mercy hospital prior to that and in my last trimester they decided to end the midwife program at the hospital and anyone that had a guess date after June 15th had to transition to another doctor. I picked the most natural doctor the hospital had, but had only met her one time prior to my birthing so we had not had that time to talk about birth plan etc. The nurse started talking about having to induce me prior to lunch at that point it was about 9:30 am. My doctor came in and asked me how I was doing I let her know of my concerns, she said that she would be okay with monitoring me and the baby all day and said we could wait and see if my body decided to start the birth waves naturally. She told me to have a little talk with my baby and we would see what happens. I asked her when I should have my doula come up and she said to wait until I actually started having my birthing waves and the nurse would check me and let me know when to call her. At the same time this is all going on the area of the hospital was in a tornado watch and I didn’t want my doula out in the weather until it was closer to time. I decided to listen to the Easy Comfortable Childbirth track to help me visualize my birth and to help me start having birthing waves. At about 12:30 pm I started having some mild birthing waves, and was able to breathe through them with ease. That continued until a little after 2 pm and then the birthing waves started to get more intense. I had eaten breakfast and I got up and told my husband that I needed to go to the restroom and when I sat up I got nauseated. I got back in bed and told my husband to let the nurse know that I had gotten sick. She came in and my birthing waves got much stronger. She asked me if I thought I needed to be checked, I said I thought I needed to be. She checked me and said we are about to have a baby. She called my doctor and I asked her if she thought my doula would make it in time, she asked me how long it would take the doula to get there and I told her she lived 45 minutes away. She said that my doula wasn’t going to be able to make it that I would be lucky if my doctor made it back over in time since she had to drive about 25 minutes. They started getting prepped for my birth in the room. Since the baby was 5 weeks early they had about 15 different people in my room to make sure everything was okay when she was born. My nurse did a great job of making sure I breathing properly and kept me from pushing too early. She was great at keeping me calm. My husband was good at doing the Relax cues and held my hand through the whole birthing. My doctor arrived soon after and we got started at that point she wanted me to push and within about 15-20 minutes I got to meet my little girl and she was healthy. We were able to do skin to skin right away and she started latching right away. The baby did great and we were able to come home within 3 days. I was up and walking around within an hour of giving birth, and could not be happier with my experience. 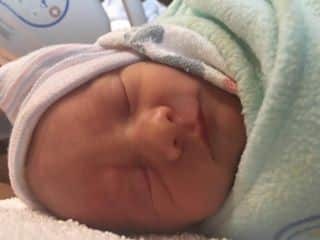 I am thankful to Hypnobabies for putting together this program and giving me the confidence to do a natural un-medicated birth with our first child.